With more than five million copies in print, this edition’s influence has been observed far and wide. The Declaration of Independence and the Constitution of the United States. Check the Constitution! nice product & arrived quickly! 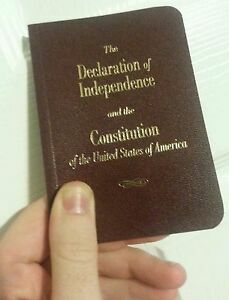 Although it is impossible to fit into a man's wallet, it is a must carry for every American who still believes in their individual freedom and rights enumerated in this authorative document of law protecting those rights. It is shirt pocket size, barely one quarter inch in thickness and is bound by a very leather like durable material. It is amazing they were able to use as large and legible a font for ease of reading, especially since it is the complete Constitutional document. At such an exceptional bargain, I recommend purchasing several copies to give to family and friends, and sometimes even a stranger engaged in conversation who obviously seems uneducated in this most powerful and significant weapon against tyranny. Also a great defense when encountering a constitutionally sworn official when you know they are violating your protected rights. This maybe one of your greatest personal possessions ever purchased, especially living in these precarious times. Arm yourself today. This is the American vision of what government should be. Many people think that America is a democracy but it is actually a constitutional democracy. The Constitution of the United States sets limits to the powers of government in Article 1, Section 8 (pgs 23-5). Outside of these enumerated powers the government has no authority to do anything else. It really is a beautiful system of government. All law-making powers are vested in the Senate and House of Representatives. However, a president can check their power by vetoing any laws they pass, which they can then override by a 2/3 majority in both houses. The president's function is to "preserve, protect and defend the Constitution" and to the the Commander in Chief of the Army and Navy of the United States. The Supreme Court and other courts oversee the laws passed by the legislature and, I suppose, the actions of the president to make sure that they fall within the bounds set by the Constitution. Congress has the ability to add to the Constitution by passing amendments. And the Bill of Rights lays out a few rights of the people and states that are absolutely not to be infringed upon, though the enumerated powers already limits the power granted to the federal government. Roger Pilon's brief Preface is about as much bang for the word as one could ask for. Check it out! Thin, strong product with powerful words. Highly recommended! This is a fabulous little item. It is well-made and contains some of the most important documents in our nation's history. The paper is good quality and the words/font are easy to read. It is much thinner than you might imagine, making it easy to carry around. As an officer in the United States Air Force, I and others have been strongly encouraged to carry a copy of the constitution with us and refer to it often. When we took our oath of office, we promised to defend and uphold the constitution. We need to read and understand it in order to know what it is that we are defending. I pass on that encouragement to every person living in the United States. Get one of these. Get lots of them and give them to your friends and family. Everyone living in the United States should be familiar with its history, and the constitution which they are honor-bound to uphold. These are not in the public schools but should be and should be taught. Great for home school, stocking stuffer, hand out to friends, sell on road side or flea market, endless uses for these , not to mention knowing ones rights is important :) These are better quality than the longer pamphlet looking type commonly seen around. This little book is very nice to have because it is small and easy to just open and look at wherever you may be. It also reminds us of what our forefathers fought and died for to forge this country. Everyone in Washington DC needs a copy to refer to,seems they forgot. This is a great book to have.